Reading The Canon for the first time as a 7th or 8th grader, we encountered a lot of terms that were new to us. Barque (or bark), billet and nasty cropper, dolichocephalic, mendicant, and tide-waiter come to mind. Another is “lascar”. Many of these terms inspired us to look them up, thereby learning something. Probably something useless, but interesting nonetheless. Sometimes they were big words we just didn’t know, some were simply British terms not familiar to Americans, and some were obscure or outdated terms from the Victorian era. One term that we liked because of its alliterative sound quality was “Rascally Lascar”, a villainous operator of an opium den in The Man with the Twisted Lip (TWIS). We understood “rascally” of course, but kind of glossed over “lascar” and just assumed it meant a disreputable and untrustworthy person. Not being the sort of term that pops up in everyday conversation, it just stayed in our mind that way for a period of several decades. But not too long ago we realized this vacuum in our vocabulary had to be checked. Turns out “lascar” is more interesting than that. 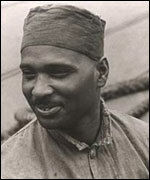 “Lascar” means an Indian sailor (from India) serving in the British merchant marine. The meaning came to be expanded to be just about any foreign sailor from east of the Cape of Good Hope, whether East African, Indian, Malaysian or from anywhere in the East Indies. Generally, sailors would be hired in foreign ports to fill posts on British ships vacated by desertion, disease, injury, or death. When the ships returned to England, ideally, the foreign sailors would stay on as crew. Of course some of them simply left ship, or could not find a position to take them back where they came from. Gradually over 200 years or so, this meant an influx of what we now call undocumented immigrants, particularly in the East End docks. The lascars did not have an ideal existence, and generally had to live by their wits. They were often taken advantage of. Language problems and age-old discrimination issues put the lascars at a social disadvantage. By the mid-1800’s there was legislation to protect the lascars, and also to control their entry into society. Many ended up, just like the Rascally Lascar in TWIS, doing whatever they had to do to make a living, particularly if they were clever and unscrupulous individuals. The British government tried to control the number of non-British seamen in a crew, but these rules tended to be self-defeating. If a ship in a foreign port hired crewmen as needed, there was little that could be done once they got to their home port. The rules designed to control the numbers tended to work against the lascars. If they could not qualify for a vacant post on a vessel going their way, they would be stuck where they were. The origin of the term “lascar” is based upon the Persian term, “lashkar”, (لشکرگاه) which meant army camp or barracks, and was gradually expanded to mean soldier or sailor. In modern times the term is considered archaic and is not commonly used. If you find yourself in the East End of London and feel the urge to puff on some opium, go to the Bar of Gold in Upper Swandam Lane (a vile alley). But beware the Rascally Lascar! Don’t trust him farther than you can throw him.